Just thought I'd post an update of the further rapid growth...now the pics encompass a little less than a month...shows how quickly plants really do grow! It's hard to really appreciate it otherwise...and most times the progress seems so slow. Hopefully, by this time next month, everything will be pretty much filling in and there won't be such huge gaps in the garden. I believe this monarda blooms in midsummer, so I've probably got a while to wait before blooms. 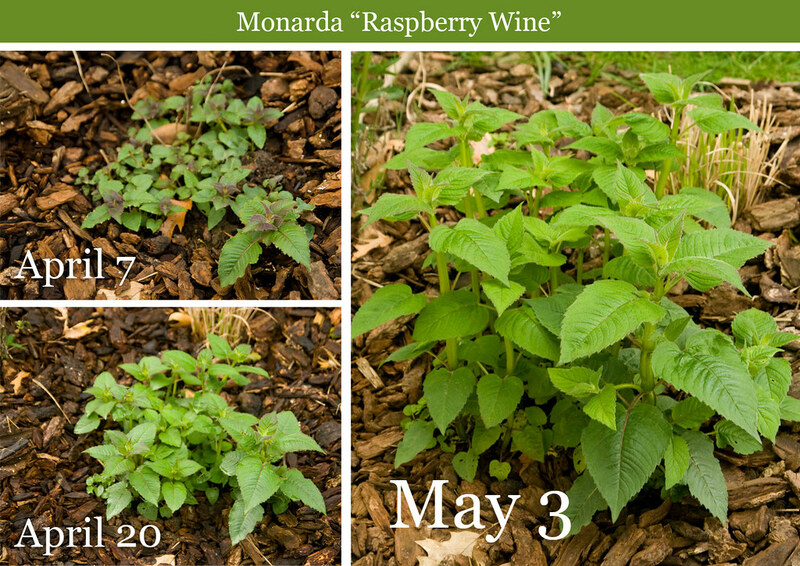 This time, it's Monarda "Raspberry Wine". While not as dramatic as the previous Joe Pye post below, it's still fun to see how much growth a plant can put on...and it's interesting how quickly we forget how small they were at first. This was actually one of the very first plants to emerge this spring, I think there were little sprouts poking up as early as February. They just stayed as little sprounts for quite a while before really putting on some growth last month, and now you can practically watch them grow by the day. I planted these late last fall, so haven't seen them bloom yet...but having seen a full-grown specimen at Joy Creek Nursery (where I bought the seedling), I can't wait to see it in bloom!